This year we as a family decided to turn the TV off for Lent – forty days without the tube. With the new baby, the holidays, and all of the other stressors we’ve had, there had been lots of Netflix and video gaming in the Robinson household. So this was going to be hard, but doing it as a family is the key. For Christians, Lent is a time of reflection on the sacrifices of Christ. It’s the forty days before Easter, starting with Ash Wednesday. We try in small ways to make some sacrifices ourselves in an effort to bring ourselves closer to God. It’s a wonderful time of growth and expansion, probably because it is a challenge. The idea is to give up things that are not necessarily harmful to us but rather luxuries that we would otherwise feel entitled to. So you wouldn’t necessarily use this time to give up smoking, but of course there’s never a bad time to give that up. Day 1 – Ash Wednesday. Church! Dinner at the table with everyone. The house felt so quiet. Shockingly quiet. It’s amazing how without that background noise (which is of course what TV tends to be) there is just this emptiness. A bit of a jolt to adjust to. Day 2 – Thursday. This day was a bit more challenging. The boys however discovered a love of bath time. They took four baths between the two of them – two together and one each alone. We were admittedly shocked at this development. Day 3 – I was home from my internship. We read lots of books today and the boys spent a ton of time outside. Also got their room a bit clean! Went to see hubby’s grandfather and spent a great portion of the afternoon there. Day 4 – Saturday. The hubby was gone with his dad all morning, so the boys and I enjoyed a super quiet day. We listened to a lot of NPR. The boys played with their Skylanders – these little statue toy things that go with the Wii. The boys played out their game WITHOUT their game. It was super fun to see. They played out this elaborate story with their figures. For a while Virgil was even the bad guy. Day 5 – Sunday. Church again in the morning. I am so proud of my boys, who are hanging with it so well. We’ve talked a lot about God and sacrifice, how it can make you a better person. However, Yeats says that next year he’s giving up homeschool for Lent. Day 6 – Monday. 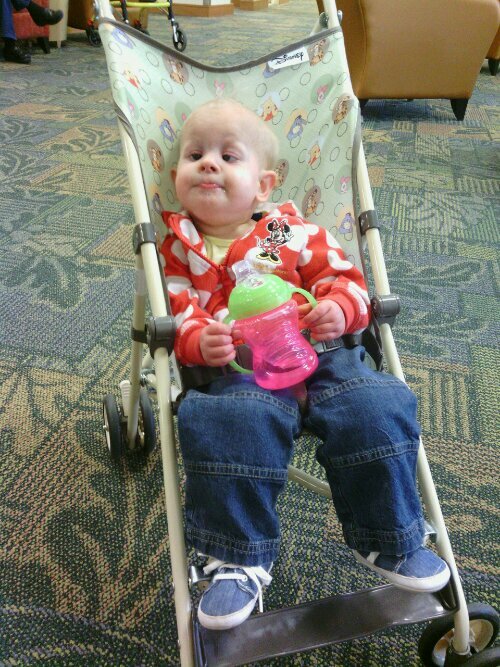 Took Hermione to PT and her first speech. Hubby did karate with the boys. An easy day! Day 8 – Wednesday. 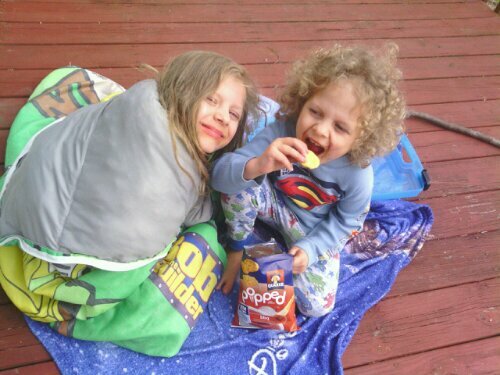 We decided to have a picnic on the deck. In the cold. With blankets. Day 9 – Thursday. 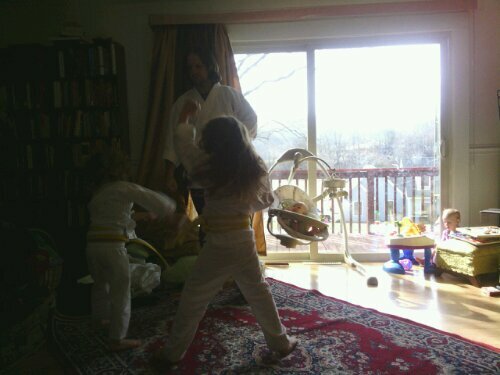 Karate with the family. This is perhaps my favorite picture ever! Day 10 – Friday. The boys rediscovered their Cars racetrack. An afternoon of racing ensues. More to come as the days roll on toward Easter!